Trump seems to go after Amazon for the wrong issue and it might seem evident that Trump might be using the federal government to punish his political opponents. 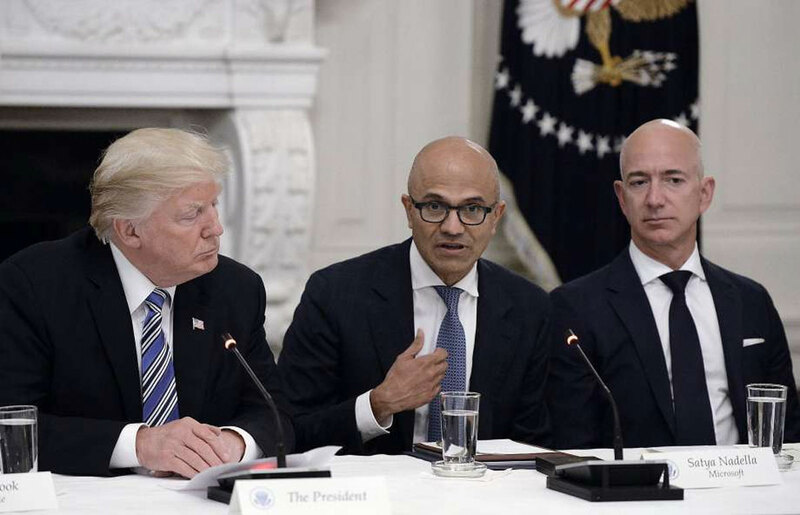 FILE - From left, U.S. President Donald Trump, Microsoft CEO Stya Nadella and Amazon CEO Jeff Bezos attend a meeting of the American Technology Council on Monday, June 19, 2017 in the State Dining Room of the White House in Washington, D.C. Without evidence any evidence to back up his criticisms or suggest any specific actions he planned to take, President Donald Trump accused Amazon.com Inc of not paying enough tax, taking advantage of the U.S. postal system and putting small retailers out of business. Trump has attacked Amazon and its Chief Executive Jeff Bezos several times, and his latest comment on Twitter came a day after news website Axios reported that Trump was obsessed with the world’s largest online retailer and wanted to rein in its growing power with federal antitrust laws. But Trump seems to go after Amazon for the wrong issue: China, not taxes. Taxes are messy, but that’s not how Amazon is killing small retailers. As of last year, Amazon has been collecting sales taxes in every state where one applies. Third-party sellers — those who use Amazon’s platform for distribution — have to collect sales taxes in a growing number of states and, in some cases, Amazon is required to play the role of enforcer. Trump has seemingly had it in for Amazon CEO Jeff Bezos since the presidential campaign, presumably because of how The Washington Post, which Bezos also owns, covered him as a candidate and now as president. Throughout his attacks, Trump has criticized Amazon for being a “no profit” company, bilking the United States Post Office, not paying its fair share of taxes and for supposedly having sinister ties to The Washington Post. There is little to these claims. While the postal service is struggling, it’s not because of Amazon. In fact, package delivery is one of the few lines of business that’s growing. The postal service has lost money for 11 straight years, mostly because of pension and health care costs. In 2017, the service lost $800 million on $69.7 billion operating revenue. Under a 2006 law, it must pre-fund 75 years’ worth of retiree health benefits. Neither the government nor private companies are required to do that. (It has defaulted on those payments periodically, with the last one made in 2015). Besides, Amazon ships enough with the post office to qualify for bulk rates, giving it a significant volume discount that varies depending on package weight and number. Amazon uses FedEx and UPS as well as well as its own fleet of carriers, but it often relies on the post office for ‘last mile’ delivery—bringing a package to a customer’s door. Trump is taking a position that is somewhat populist—a rare actual occurrence, even though the label is often applied to him. But because of his selective outrage, and his history of negative comments about Amazon CEO Jeff Bezos and The Washington Post, the newspaper Bezos owns, Trump’s lashing out now reads as conflicted at best and bad faith at worst. There’s also a certain cleverness in Trump attacking Amazon, or Time Warner and AT&T. He is pushing ideas with which some of his most dedicated critics on the left agree, and voters are unlikely to mobilize en masse in sympathy for big corporations. But these cases might seem evidence that Trump might be using the federal government to punish his political opponents. 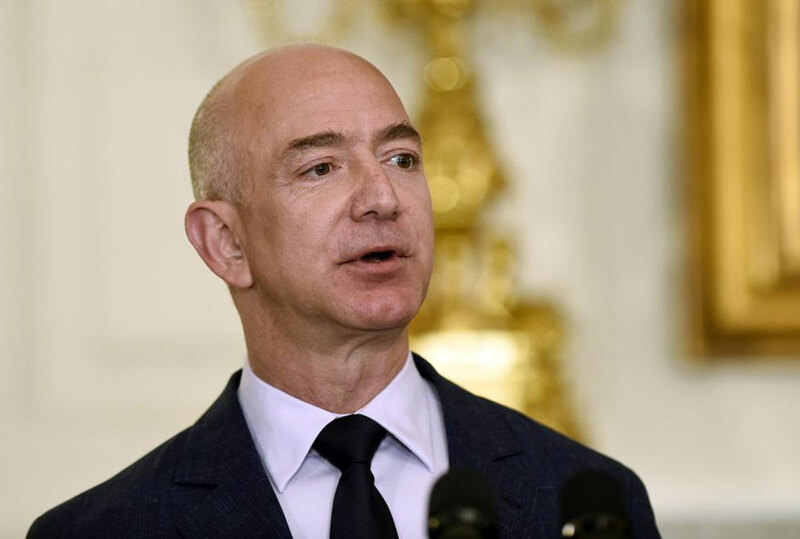 As New York’s Jonathan Chait laid out on his article, the president’s critiques of Amazon are inextricable from his longstanding attacks on the Bezos-owned Washington Post. Trump is correct on the effect of Amazon on retailers because efficient retailers have been displacing inefficient retailers since the beginning of time. But with Amazon, Trump is wrong. The company is in the process of building its own logistics network. If an arrangement were to become uneconomic to Amazon, Amazon has plenty of options, and USPS will not be one.